↠ Unlike animals in usual, reindeers don`t have a natural sense of fear towards cars. Reindeers are curious. Reindeers can behave in unpredictable way. Therefore you should always reduce speed while driving and spotting a reindeer. ↠ Reindeers do have an amazing sense of smell. They can smell their food, such us lichen, through a meter high pile of snow. And they can smell whether there will be enough of it too. This is one of the natural coping methods that helps them to survive through a rough winter. ↠ Training a reindeer for tourism (eg. for sledge rides) takes as long as 4 to 5 years. So it is a heavy loss, losing that reindeer in an accident. From January to March reindeers lose their weight. Their moving diminishes. They eat lichen, beard moss and bare twigs. They will get some extra feeding if necessary. In April the reindeers are slowly moving to their spring and summer pastures and calving areas. The calving begins. The females over three years old shed their antlers. The ones who are pregnant do it after the ones not pregnant. New life is celebrated in May. Most of the fawns are born. The peak is around the 18th of May. The reindeers eat different plants. During June the calving ends. The reindeers are bugged with flying and stinging insects. They do their best to escape from the mosquitos and blackflies by moving to more open areas like fells, swamps, logging areas, fields and roads. The fawns are marked in June. Reindeers renew their hair. Females shed their antlers after giving birth. They grow new antlers with leather skin. In July the mosquitos are still bothering the reindeers. Marking the fawns ends. The reindeers are still renewing their hair and the new antlers keep growing too. In August the insects are still bugging. The new winter hair of the reindeers thickens. They gain weight. Their antlers are now as big as they will get. In September the rutting time starts. The males are gathering their rutting troops. The reindeers are rubbing their antlers against the trees and getting rid of the leather skin. The beginning of October is the peak of the rut. Reindeer round-ups start to take place. In November the round-ups continue. The rut is over. Reindeers are moving towards their winter pastures. The males shed their antlers after the rug. The roads are being salted in order to reduce the slippery. The road salt draws the reindeers to the roads. 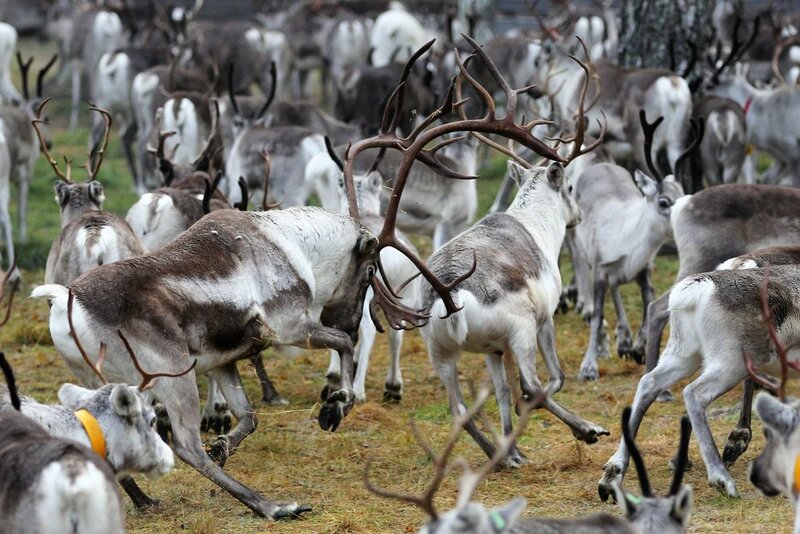 In December the reindeers move to their winter pastures. They are still tempted by the road salt. They eat plants and mushrooms under the snow, lichen and bare twigs.